Hi lovely readers! The following post is the guest post I did for Lail at With a Spin yesterday. I am posting it here on my site too so you can have access to the recipe. I had some readers email me requesting that I make it available here too. I hope you will still go and say “hi” to Lail over at With a Spin. Thank you for reading and I will see you here soon. Hope you are having a great weekend. It is an honour to be guest posting over here at With A Spin. I am Nazneen from the blog Coffee and Crumpets. When Lail asked me whether I could write a Ramadan post for her I agreed enthusiastically. I have gotten to know Lail over the last few months and I am in awe of her dedication to her family, her career, her blog and her heritage. I have learnt more about Bangladeshi cooking from Lail than from my Bangladeshi friends here! I hope one day to have the occasion to meet her when I am going through Texas again. Lail asked me to share a recipe that is close to my heritage or upbringing. I thought about that for a while and I remember emailing her and telling her that I am of a very confusing heritage! My family is from India but I was born in Saudi Arabia, grew up in England and married an American, I never had the opportunity to experience India at any length. Short summer holidays away was the extent of my time there. In that sense, it has always been difficult for me to truly understand customs and cultures of my ethnic country. I am very much British in my thinking and up bringing and even though my children try to Americanise me, I’ve been resisting for a while. I don’t know how long I can last; there are four of them and one of me! What was I going to pick?? All those countries run through my veins. I ate mainly Indian food growing up but Middle Eastern food and British food are also very much part of my life. We visited Saudi often and I still have family who live there, and British food was easily available. Now in my own kitchen, I take a keen interest in reviving British classics at home. In the end, it was Ramadan comfort food that won out. I really enjoy Middle Eastern desserts during Ramadan. It maybe they are made for that reason, to enjoy after a long day of fasting with the right amount of sweetness, creaminess or nuttiness. My favourite Middle Eastern bakery in Houston inspired this particular recipe. The lady who owns the bakery is Lebanese and really wonderful, and she does an awesome job with her desserts. I don’t really care for baklava unless it comes from her place. She does a great baklava. She also does great Kunafah Rolls and they are some of favourite treats from her store. But, you have to get there early, Ramadan weekends she is sold out by early afternoon. Living in Colorado now, I sure miss her treats. The pastry for these is just regular phyllo sheets. They can be a bit tricky but I don’t buy the thinnest sheets. 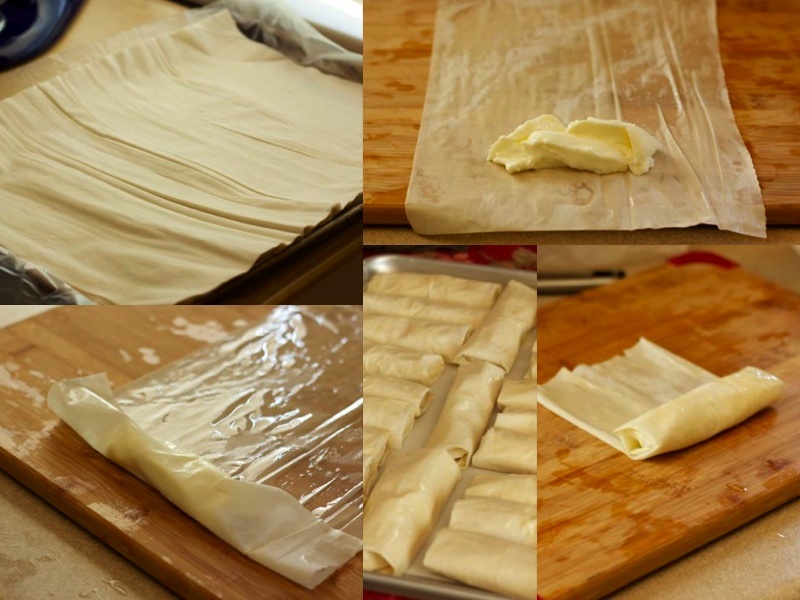 Phyllo sheets are available in different thicknesses and I prefer the next thickness up. It’s a lot easier to handle. Keep a wet towel over the sheets to keep them from drying out and work quickly. I used half sheets to make the rolls because I wanted smaller rolls and not too much pastry over powering the creamy filling, if you would like bigger rolls and more crunch, by all means use a full sheet per roll. Ashta is a Middle Eastern clotted cream. There are many ways to make this but I use a very simple recipe and it tastes like the filling in the store bought rolls. This is a versatile filling and can be used for the Arabic pancakes called Ataif bil Ashta also (my favourite Ramadan dessert). Pour all but a half cup of the half/half-cream mixture into a heavy bottomed pot and bring to boil over medium heat. Stir the cornstarch into the remaining half cup and smooth out into a paste. Once the milk is nearly to a boil, add the cornstarch mixture and stir vigorously. The mixture will thicken instantly and as soon it bubbles and is thick, pull off the heat. Put a piece of cling wrap directly onto the surface of the ashta and place in fridge to cool. place the sugar, water, lemon juice in a pot and bring to a boil. Lower the heat and simmer gently for 8-10 minutes. The syrup should be thick enough to lightly coat the back of a spoon. Add the orange blossom water and pull off the heat to cool. Put aside. Prepare the syrup and ashta the day before so that they can chill overnight. Add the oil to the melted butter and keep aside. Lay a sheet of phyllo dough on the counter or chopping board and brush liberally with the melted butter and oil mixture. If you are making the smaller rolls, cut the sheet in half. Lay a tablespoon or so of ashta in a log shape at one end of the phyllo sheet. Brushing with more butter if needed to keep the roll moist and able to stick. Make sure you only bake 12 on one sheet because they do expand whilst baking. Unfortunately, mine had a run in with an enthusiastic toaster oven when I went to crisp them up again for the photos and so they got a little more tinged than I wanted, they were still excellent though. Don't overstuff them because they will seep through the rolls if they are not tightly wrapped. Make sure they are moist and sealed well. Once out of the oven, let them cool slightly and then drizzle the sugar syrup over them or serve with the syrup on the side. Garnish with some chopped pistachios or rose petal jam. Makes 12 large or 24 small rolls. 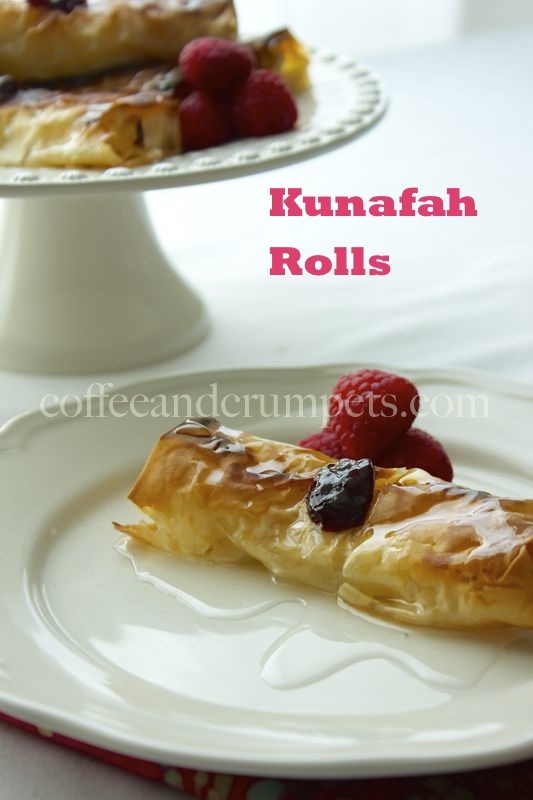 I hope you try making these Kunafah Rolls and enjoy them as much as I do. I would like to thank Lail for giving me the opportunity to guest post for her. It’s been an honour and a pleasure. Thank you for reading and I hope to see you again. Oh wow these look delicious! Never tried something like that before, but would love too! just reading it is making me salivate! yummmm! Salam, Nazneen! Our local Mediterranean restaurant serves this dessert, although theirs is a bit different. It’s in the shape of a square, has cheese inside it, and some shredded stuff on top (have no idea what that is, lol, forgive me). Are you familiar with this style of kinafa? Or am I confused and is it not even the same thing? : ) They call it kinafa at the restaurant. Wasalam Sheema, kunafa comes in a variety of shapes and sizes. I am familiar with the one you are talking about and I do make that one also. That is probably the most traditional kunafa. In those, the phyllo dough is shredded and you toss it with butter layer it. Some other kunafa call for sheets of phyllo and they can be called something different. I just called these kunafa rolls because in essence they are the same as the shredded stuff but in rolls! Hope that helps! Those look yummy. I really want to try one. Thanks for your recipe. How delightful Nazneen – what is ashtar by the way? I don’t think I’ve ever heard of this ingredient before! Thanks Charles. Ashta is a kind of a ME clotted cream, it’s basically a thickened cream. Recipe is in the post. Thanks Min! I love Phoenicia too! It’s my favourite ethnic store in Houston. I can spend all day there 🙂 The store I am talking about is called The Sweet Factory on Hillcroft (close to 59 South). It’s next to a big ME meat store called Jerusalem. If you’re in Houston you simply must try The Sweet Factory. Absolutely beautiful, Nazneen! I had no idea that there were different thicknesses of phyllo sheets. Thanks Karen! Yes, you can find the different thicknesses at a well stocked Middle Eastern or Eastern European store. The grocery stores only carry one kind. Nazneen, these look so delicious and heavenly! Thanks Holly! They are quite delicious. Good golly! These look scrumptious! Shashi @ http://runninsrilankan.com recently posted..It’s the Liebster Award Post Y’all! Again, you had me at orange blossom water. Yummmmmmm! Yes, there has been much use of the wonderful orange blossom water lately, I love it! This is one fantastic dessert. I visited your guest place and love the idea of the middle having no cheese but just thickened cream and love that sweet topping. I think I would gain weight if I lived at your house! Thanks Bam! I much prefer the cream version than the cheese one so I always tend to use the ashta. Thank you for visiting me at both places!! Thank you so much for the wonderful guest post Nazneen. I love Middle Eastern food and the rolls are perfect to satisfy my sweet tooth. I loved knowing you a little more through this post. I seriously hope we get to meet face to face one day soon, inshaAllah. You’re most welcome Lail, it was a pleasure! Sounds like fun! On my way over now . . .
What a gorgeous dessert, Nazneen! Just visited Lail’s and read your post. It truly amazes me how culture, upbringing and food co exists in the essence of the past. I am enjoying your Indian, Mediterranean and British food post. and also American. Thank you Balvinder! I appreciate your support!! Nazneen, this has been on mind for a while, surely going to checkout Lail’s blog. Thanks Asha! I am glad I posted this then! Simply divine! Just visited Lail’s and read your lovely post. Hope you are having a great weekend Nazneen!